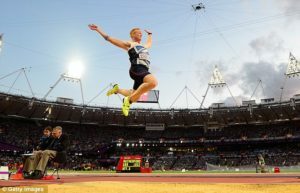 If like us you are glued to the Olympic games in Rio at the moment, you are probably in awe of the incredible athletic feats that are on display. 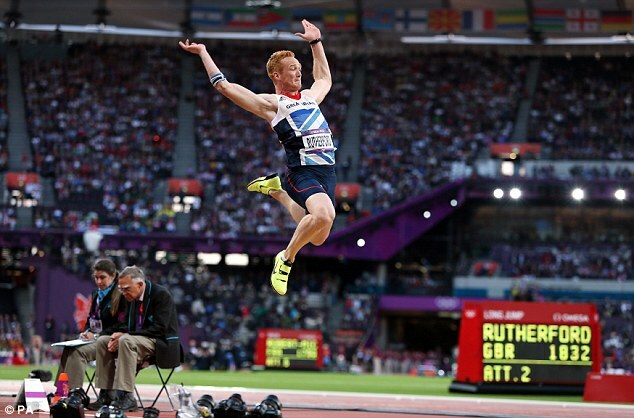 We caught up Olympic long jump champion Greg Rutherford this morning to ask him why and what is his favourite gym exercise to improve athletic performance. Whilst Greg is currently in the Olympic village preparing to defend his Olympic title in a few days time, he was happy to share a small glimpse into how he prepares to perform those incredible gravity defying jumps. Below are some pointers for performing these exercises. Both of which not only increase athletic performance, but can both go along way to improving overall body composition. Stand straight up holding either dumb bells at your side or a barbell on the back of your shoulders. Place one foot onto a box by flexing the knee and hip joint. The height of the box can vary depending on ability, but aiming for around a 90 degree angle at the hip and knee would be ideal. Maintaining a high chest whilst bracing the core drive the lead led up keeping the weight in the centre of your foot and step up onto the box. Carefully lower yourself back down to the start position and repeat for 8-12 reps.
Take a short rest and then switch legs. In the start/bottom position, set up so your toes are directly under the bar, unlike the deadlift ensure the bar is not resting directly against the shin to allow proper loading without having to roll the bar forward on the initial ascent. As you begin to the lift the bar (explosively) keep the back flat and shoulders over the bar, making sure the hips are lower than the shoulders. Forcefully extend the hips and knees as you exhale keeping your arms fully extended. When your lower body joints are all fully extended shrug your shoulders upward rapidly not allowing the elbows to flex. When your shoulder are at there highest elevation begin to flex the elbows pulling your body under the bar. Continue to pull the bar as high and as long as possible. After the lower body has fully extended and the bar reaches maximal height, pull your body under the bar and rotate your arms underhand around the bar, simultaneously dropping your hips into a quarter squat position. Once your arms are under the bar lift your elbows to parallel to the floor and rest the bar on your collar and shoulder muscles. Then stand up/squat up into a fully extended position. Control the weight back down gradually making contact again with the thighs and squat back dow to the start position and repeat.